Welcome to Samosas and Sunshine! The goal of this website is to give readers advice, anecdotes and resources from a non-Indian bride who has recently married into a South Indian family. From info on where to get your family outfits for the wedding to the hilarious tale of my first puja and from my MIL’s semi-secret samosa recipe to a guide detailing what you’re supposed to call you FIL’s elder sister, Samosas & Sunshine will be a humorous resource for Indians and non-Indians alike. A smiley blond, Sunshine has been my nickname since childhood. “Samosas” is because they’re delicious! My MIL (mother-in-law) makes amazing samosas, and I hope to be able to make them one day too! In college, I became interested in Indian culture and made my first trip to India in 2006. When I went back to school that fall met and woo’d my now husband with my “extensive” knowledge of Bollywood. After 8 years and another trip to India, I thought I was pretty knowledgable about Indian culture. But nothing could prepare me for what happened after my Husband popped the question, and I said yes. 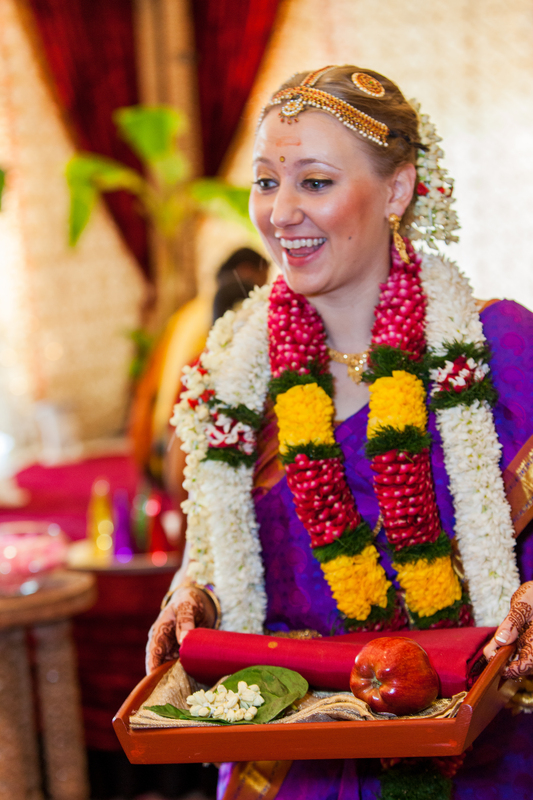 The full force of a new Indian family and the wedding planning process was a crash course in family relations, South Indian traditions, Hinduism, DIL obligations, Indian food, the Indian American community and so much more. I finally became a South Indian wife in the fall of 2015 (and will be a South Indian mother soon if my grandmother-in-law has her way!). I hope my experiences could make someone else’s less overwhelming. Plus, I want to hear from others out there, so I have the tools to cope as I enter this whole new phase of life. Do it at your own pace, no rush! Its just my way of saying I love your blog!